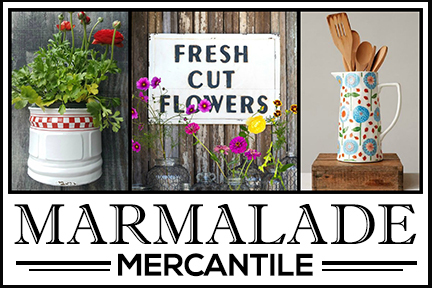 My heart is torn between farmhouse and cottage decorating style, which means I typically end up fusing the two together as much as possible. I’ve been doing a bit of tweaking to the entry way, adding touches of cottage style. The entry way isn’t a formal entry, but rather an extension of our living room. I had to be creative in positioning the furniture to appear like an entry and not just an unused portion of the living room. Our kitty Stella posed for this photo shoot while the sun poured through the window. 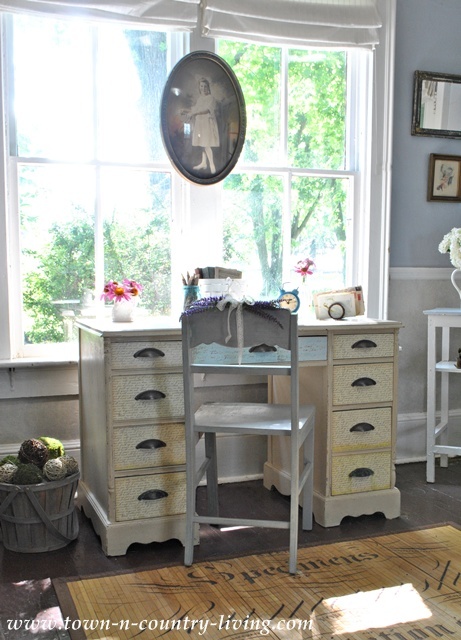 The painted and decoupaged desk sits just inside the front door, ready to collect keys and mail. This is one of my favorite spots in the house. I love the morning light that shines through the double window and it always brightens my spirits when I come down the stairs in the morning. Keeping with cottage style decorating, I kept the window treatment simple. 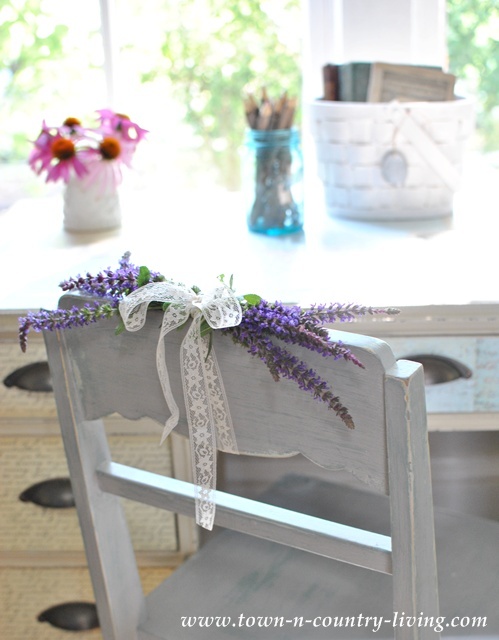 To add summer style, I tied a bunch of sage flowers to the top of the painted chair. 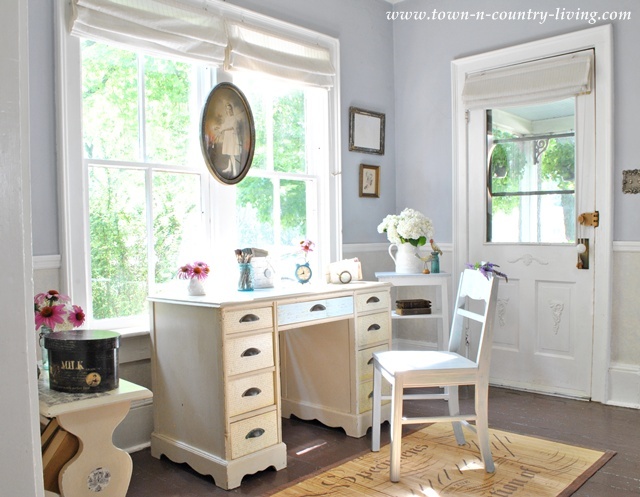 Cottage style decorating details include flowers, vintage books, and painted furniture. The branches in the corner are from my yard. 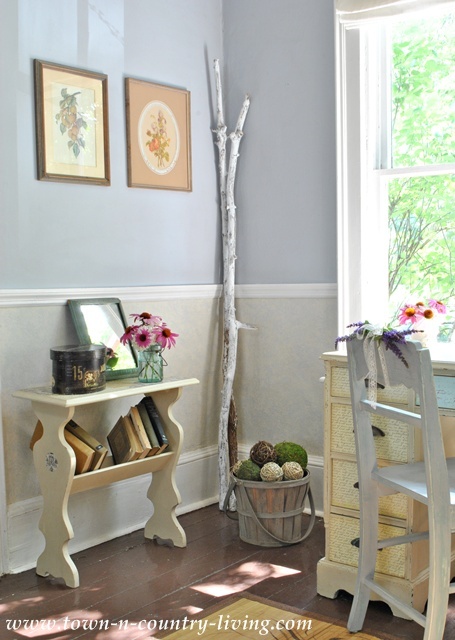 I gave them a coat of white wash to make them look like birch branches, which sell for ridiculous prices in the store. Mine were free! These flowers are from my garden. 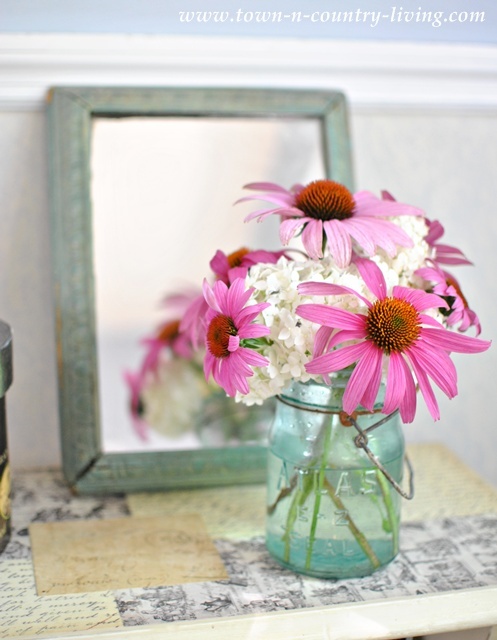 This casual arrangement in the blue Atlas jar combines coneflowers and white hydrangeas. 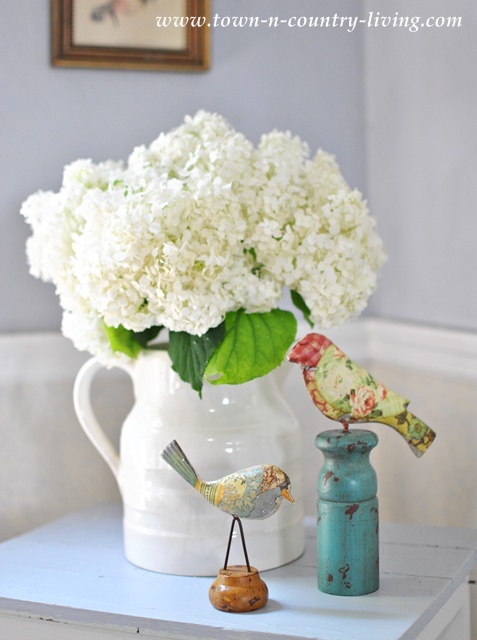 A bunch of white hydrangeas in a white ironstone pitcher provide more cottage style decorating in the entry way. A few more photos of my entry way are being saved for my summer home tour which will be posted this Wednesday as part of the Summer Showcase of Homes series. It all looks great, but I focused on the little birds next to the white pitcher. They look great. It all looks so good and love that bright sunshine. The two little birds are so cute. Just lovely, Jennifer! I can see why this sight greeting you in the morning would make you happy. I think you’ve done a great job creating an entry here. Your pictures look great, too. So pretty! Love those little birds!!!! 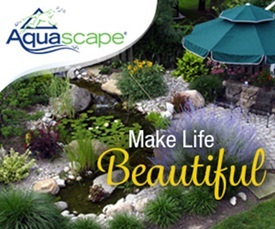 Such a happy area in your home. Every time I see that desk I love it more and more. You did such a great job on that piece. So bright and pretty… awaiting the rest of the reveal tomorrow. What a lovely and bright foyer/living room. You did a great job making it a separate space from the living room area. I like all your special cottage touches. Very pretty!! We are kindred spirits….I have the same small blue and yellow patterned metal bird. 🙂 Love your coneflowers and Queen Anne’s Lace in the canning jar. I’ll be back on Wednesday for the whole home tour. I love your desk in your foyer -I’m sure that does cut down from keys being lost and mail would not be carried into other parts of your home –looking forward to the whole tour tomorrow. 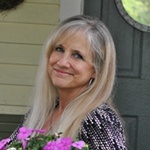 Jennifer, it is always such a delight to visit Town & Country to find out what you’ve been up to. 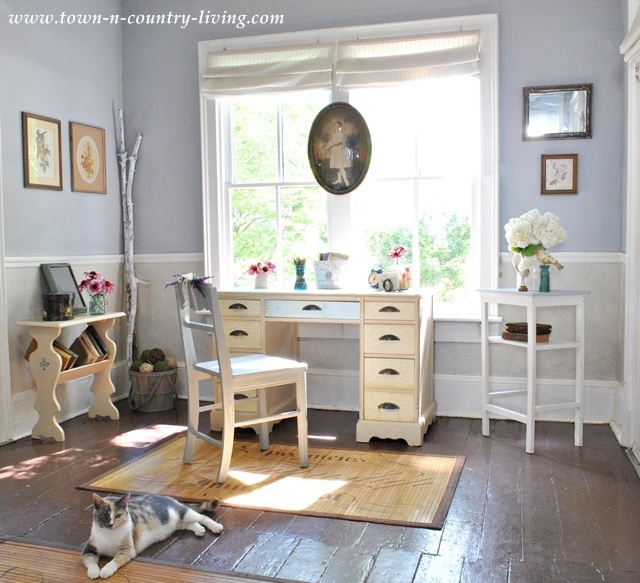 Your entryway looks lovely with the subtle little changes you have done in there. I am in the process(albeit it a slow one) of giving my home a more tranquil and peaceful attitude. My husband (a retiree)works part time, but scattered and off-beat hours, therefore I find myself doing most things single-handedly. I had to wait until my daycare duties were finished earlier this summer. I am not as fast as I once was, so the process is slower, but I am having fun with it. It has affected my blogging time, however, so I fear I am missing out on a lot of good things in that area. 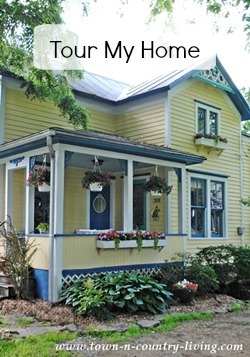 Your home is such a wonderful inspiration. Keep those beautiful posts coming! 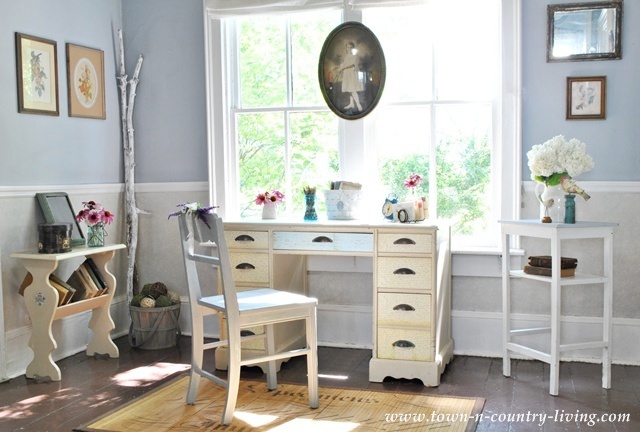 Cottage or farmhouse, I love YOUR style. What a beautifully welcoming site to walk into !!!!!!!!! The colors are so gorgeous – and you’ve staged it to perfection – really really beautful. I love the fresh white, it always makes a home feel and looks clean. I too have a front door that opens right into living room. Though full of windows it never looks bright due to wormy oak woodwork everywhere. suggestions? I love the whole place. My own home is country/farm style – in New Zealand. My favourite sitting place would be in the morning sunshine, drinking the first cup of coffee.